Experience and respect for tradition, as well as advanced competence and openness to future: since more than 50 years Carozzi unites with passion the precious skills of cheese-makers and the needs of today´s taste, giving intense emotions to persons who love cheese. 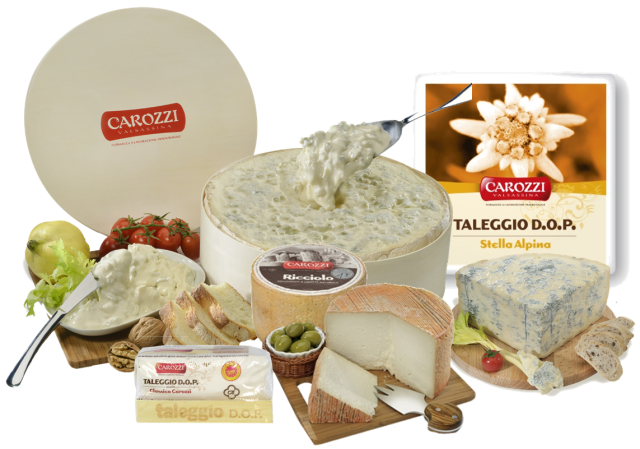 Carozzi cheeses: small masterpieces for great connoisseurs. Valsassina has always produced cheese, thanks to the plenty of pastures for cattle and to the climate that allows a perfect seasoning. Heirs of a thousand-year tradition, we refine cheeses with the passion, the uses and the knowledge of ancient cheese-makers, to bring a simple curd up to the top of quality, with the precious contributes of time, silence and experience. Only commitment and know-how, sensibility and patience, skill and respect can give a cheese the genuine taste of the ancient artisan processing. And only a place of great vocation as Valsassina can add to its taste an inimitable touch of perfection.